It’s hard to keep track of the days when you are on a tour, but I know day four was Sunday. 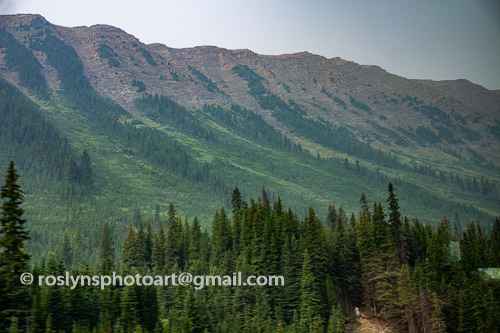 We left Waterton heading for Banff through the Kananaskis Valley. 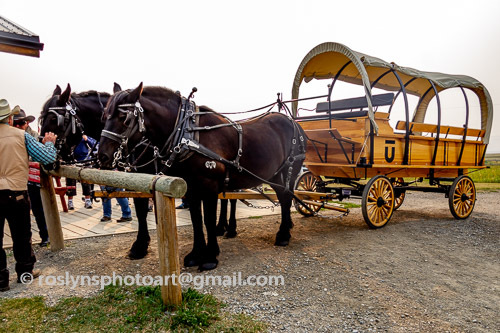 We stopped at the Bar U Ranch National Historic Site to admire the Percheron horses. 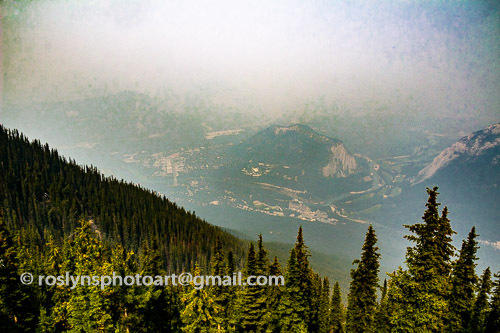 It was a very smoky day and we had 236 miles (380km) to travel. 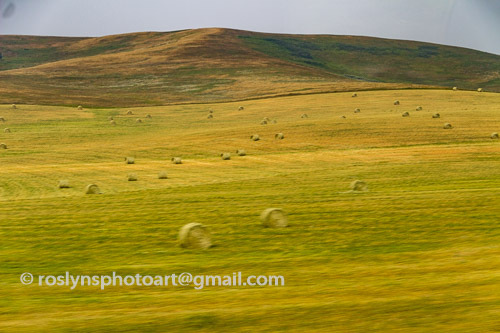 A lot of the scenery looked like this with bales of hay scattered around fields. 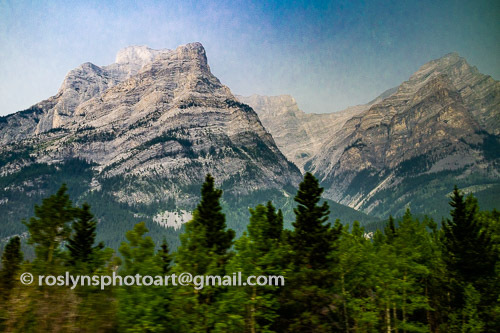 As we came nearer to Banff the scenery changed to more mountainous views. But still extremely smoky. 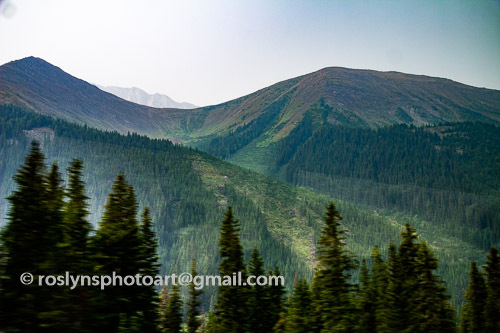 Only with RAW images and Lightroom was I able to see any kind of detail and color in the photos. 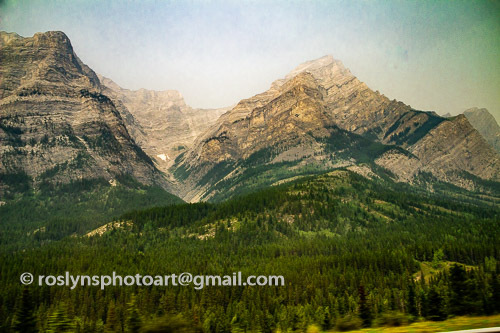 We didn’t make a lot of stops so these were taken through the bus window which is why the foregrounds are fuzzy. But you get the general idea of how rugged the territory was. 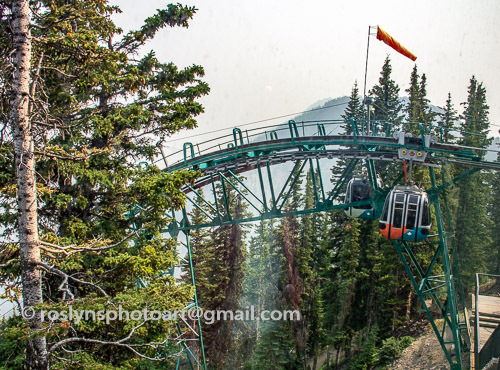 We rode the Banff Gondola to the top of Sulphur Mountain. The summit is 7486 feet (2281m) above sea level. The highest point in Los Angeles County is Mount Baldy (Mount San Antonio) at 10,064 feet (3,068 m). So I wasn’t too impressed but a good height nevertheless. Too bad there was no view. I had to work really hard in Lightroom to get any kind of details to show. 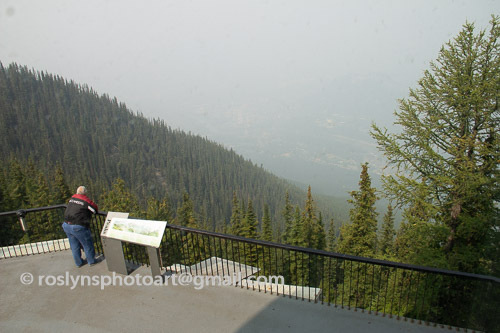 But this gentleman seemed to be enjoying the view of the smoke! We watched a 15-minute video that showed us the spectacular scenery we SHOULD have been seeing! 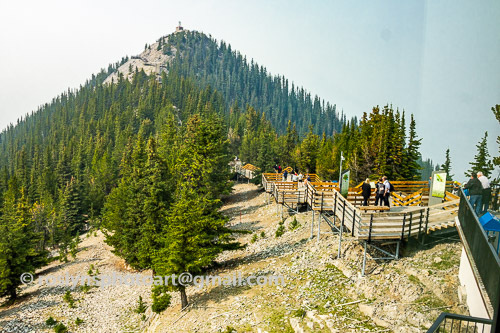 There was a nice wooden trail out to the next peak but I wasn’t about to test the limits of my vertigo to see smoke and more smoke. 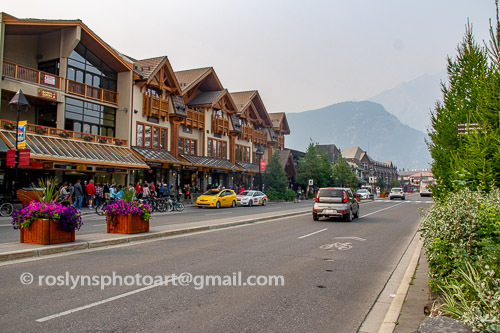 Our hotel for the next two nights was nothing spectacular but we were centrally located in the town of Banff. For me this was the most disappointing day. It reminded me of the 70s and 80s in LA when the smog was so bad in the summer I couldn’t even drive. I didn’t need to pay good money to be reminded of that. But I did enjoy a wonderful Louisiana catfish dinner at Tooloulou’s restaurant in downtown Banff. That was the highlight for me. I don’t think my friends were that excited. 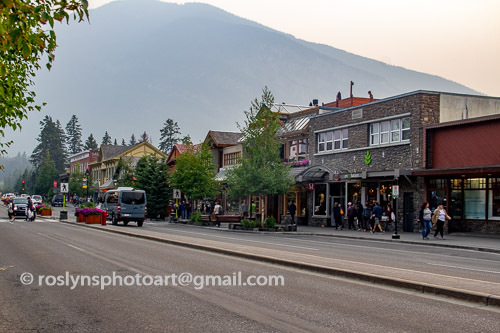 Categories: Nature, Outdoors, Photography, Scenery, Sightseeing, Tourist Attractions, Travel | Tags: Adobe Lightroom, Banff, Bar U Ranch, gondola, National Historic Site, smoke, smoky, Sulphur Mountain | Permalink. All photos and content copyright roslyn m wilkins. Please feel free to pass along this post via email or social media, but if you wish to use some of our images or text outside of the context of this blog, either give full credit to myself and RMW: the blog, or contact us for proper usage. Thanks!